Finally warm weather has returned to Minnesota. Yesterday I got home from work to clear skies and I set up my telescope. Predictably, the sky clouded over. I held out hope and a half hour after dark I could see a small break in the clouds on the horizon. 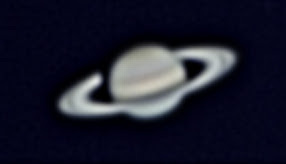 In between clouds I locked in on Saturn and started to capture quicktime videos as the clouds broke here and there. The conditions were awful. Seeing was a joke and saturn danced around on my screen from the turbulence. It is still a lot better than my first try! My best video captured 389 frames of which I could only use about 125. The picture above is a jpeg since blogger does not support an uncompressed format such as pict.